The first part of Room 4 was originally the new chapel was built behind the tower of Cola di Benvenuto Servitori as part of the extension of the palace in ca. 1330. This chapel was consecrated in 1331 to SS Louis of Toulouse and Magnus. (The earlier chapel, which was first documented in 1325, was probably under the Sala Maggiore). Fragments of the fresco decoration of the “new” chapel survive around the windows on the right wall. These windows were presumably closed when the later Cappella dei Priori (now Room 21) was built behind them in 1443-50. The rest of Room 4 belongs to the extension of the palace along what is now Corso Vannucci that was carried out in 1429-43. Ambrogio Maitani is usually credited with the carving of the originally polychrome marble figures of in the lunette above the Portale dei Santi Patroni (the entrance to the Palazzo dei Priori). They probably represent SS Herculanus, Laurence and Constantius, who were named together as the patron saints of Perugia in 1316. The figures were removed for restoration in 1993 and moved to the gallery, while copies were placed in the original location above the portal. This polychrome wooden figure of the Madonna and Child, which was a originally in Sant’ Agostino, seems to have been an object of particular veneration. It was particularly associated with the feast of the Madonna di Loreto. In the 16th century, it was housed in a niche in the pilaster between the choir and the Cappella di San Martino in the right transept, the decoration of which was financed by the Cantagallina family. It was moved to another location in the church during the remodelling of 1803 and was subsequently moved to the convent for reasons of security. It entered the gallery in 1958. The Madonna is modelled as a full-length figure in regal costume, wearing a crown and carrying the baby Jesus on her hip. He is also regally dressed, and holds a bird in His right hand (probably a finch, which is a symbol of the Passion). Recent restoration has revealed the original polychrome decoration, which is in a good state of preservation that is unusual in a work of this age. The work is sometimes attributed to Ambrogio Maitani. These two double-sided panels, which are the autograph works of the Maestro dei Dossali di Montelabate, came from the Abbazia di Santa Maria di Valdiponte, Montelabate, outside Perugia. Their original locations within that complex are unknown, but they were recorded in 1850 above the choir screen. They entered the gallery in 1863. ✴St Laurence, with St Paul (badly damaged) on the back. The panel of St Herculanus is particularly important for its depiction of what is now Piazza IV Novembre as it was in the 14th century. This dossal, which has recently been attributed to the Maestro dei Dossali di Montelabate, was moved from the nuns’ choir of San Tommaso to the gallery in 1879. It depicts the Madonna and Child with SS Agnes, James, Francis and Catherine of Alexandria. The dossal was placed in the present frame as part of a restoration in 1920. These two panels from what was originally a double-sided dossal entered the gallery from the Convento di Sant’ Antonio di Padova, Paciano Vecchio, outside Perugia in 1872. They are dated on stylistic grounds to the early 14th century and are the autograph works of the so-called Maestro di Paciano. In fact, the Convento di Sant’ Antonio did not exist until 1496, so it was clearly not the original location of the dossal. It is possible that it was originally commissioned for the Convento di Monteripido, which, like Sant' Antonio, belonged to the Observant Franciscans. The friars of Monteripido commissioned another double-sided altarpiece of similar width in 1502 (see the Monteripido Altarpiece - Room 23); they may have passed their original altarpiece to Sant' Antonio at that point. ✴a Franciscan on the right. He wears a patched cloak over his habit and has a rayonant halo that suggests that he has been beatified. If the hypothesis as to the original location of the dossal is correct, this figure is almost certainly the Blessed Giles, the early Franciscan who lived on the site of the later Convento di Monteripido. •St Mary Magdalene (represented as a hermit, clothed only in her long hair). The back of the dossal, which is damaged, originally depicted five scenes from the Passion. The central one, which was almost certainly a Crucifixion, has been completely lost. These two panels, which are attributed to the Maestro di Paciano, were recorded in the sacristy of the Oratorio di San Francesco in the 19th century and passed to the gallery in 1869. They probably formed the outer panels of a triptych. 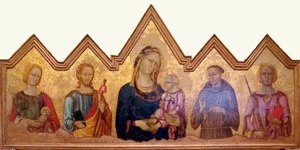 The presence of both Franciscan and Dominican saints in the panels is explained by the fact the confraternities in Perugia that were dedicated respectively to SS Francis and Dominic were closely associated. The early date of the panels suggests that this association was forged from the inception of both confraternities. This painted Crucifix, which is by a follower of Giotto, was first recorded as part of the Perkins Collection and was donated to the gallery in 1964. This small devotional panel, which entered the Accademia di Belle Arti in 1810 from an unknown location, is the autograph work of the Maestro della Madonna di Perugia. The frame, which is original, contains the marks of hinges that suggest it originally had wooded shutters. The half-length Madonna and Child are set against gold background. The baby Jesus, who wears a red tunic and sandals, reaches up and clasps the chin of the Madonna in a naturalistic gesture that is in sharp contrast with the otherwise iconic feel of the composition. This small painting on parchment, which might once have formed the back of a tabernacle, has recently been attributed to Puccio Capanna. It entered the Accademia di Belle Arti in 1810 from an unknown location. ✴the Crucifixion with the Virgin and St John the Evangelist (on the right). Each of these images is surrounded by figures of saints, including a number of Franciscans. This stained glass was removed from the window of the sacristy of Sant’ Agostino in 1863 and entered the gallery in 1879. It depicts the Crucifixion with the Virgin and St John the Evangelist. The window has been restored on a number of occasions, and not all of the glass is original. The most recent restoration was carried out in 1987. The original window has been attributed to Giovanni di Bonino on the basis of a comparison with the corresponding scene in the window at Orvieto, albeit that the iconography is different in the two works. (The cross in Orvieto is “Y” shaped). The Perugian window is usually dated to ca. 1345 because Giovanni di Bonino was called to Orvieto from Perugia in that year. However, some scholars believe that it predates the window in Orvieto. This damaged triptych, which is attributed to Bartolo di Fredi, was first documented in 1810, when it was transferred from San Simone del Carmine to the Accademia di Belle Arti. The inclusion of the prophet Elijah (see below) suggests that the work was commissioned for the church. (Elijah was regarded as the founder of the Carmelites, and his representation here as a saint wearing the Carmelite habit followed the precedent of the important polyptych (1329) that Pietro Lorenzetti had painted for the Carmelites of Siena). The Perugia triptych is usually dated to the 1360s on stylistic grounds, although it might have been commissioned after the rebuilding of the church in 1377. There is no record of the artist’s presence in Perugia, and it could have been painted in Siena. Other panels from this polyptych in the Museo Civico, Forlì depict SS Gregory and Mary Magdalene. This panel, which was probably originally part of a triptych, has lost its upper part. Federico Zeri (see the page on the artist) included it among the corpus of works that he attributed to the Maestro della Dormitio di Terni. He reported that it had entered the Ferroni Collection in Rome before 1909, but it is otherwise of unknown provenance. The upper part of the panel has clearly been reconstructed.